Earth Day 2018…Who is with me? Transforming a Science Teacher to Become Green. We Future Cycle is very proud to have inspired Mrs McCue to not only become green but also to share with all of us her story. “Mrs. McCue, are you going to stop buying bottled water?” asked one of my students gathered around me at the door, waiting for the bell to ring. Forty eyes were on me. We had just heard a We Future Cycle guest speaker teach us about water treatment and the perils of too much plastic in our world. I looked over at my desk and spied one small water bottle I had gotten that day at a school event, and two half-filled water bottles I had brought from home. “Yes – I should, shouldn’t I?” I thought to myself, “I have no excuse. Our tap water is fine! I have several reusable beverage containers taking up space in my kitchen cabinet. Why don’t I fill those daily, like I bring my lunch to school every day? If I am going to teach these students to be responsible caretakers of the earth, I should begin by modeling responsible earth-friendly behavior! Of course I should! Aside from hearing this message loud and clear from Anna Giordano, I had been prompted as well by a few recent news stories. The visual of the Great Garbage Patch in the Pacific Ocean haunted me, as did the horrific photo of the sea turtle with a plastic straw being extracted from its nose. The focus on this year’s Earth Day 2018 is: End Plastic Pollution. It’s time for me to practice what I preach. Several days after this “no-more-bottled-water-epiphany”, at the start of spring break, I found myself on a beach out in Long Island. It was a sunny, windy, 45 degree day, so there was not another person on this long stretch of beach. Two seagulls eyed me as I walked by, snapping their photo. I was noticing the beach erosion from several recent nor’easters and began to think about some other results of these storms. An entire tree lay on the sand. “What else may have washed in during these storms?” I thought. As I walked along, I admired the rocks and shells, my reverie interrupted by an occasional plastic straw. I noticed a pink plastic wrist coil keychain. Then I saw remnants of a purple balloon. It looked like a piece of seaweed – this could easily be mistaken for seaweed by a hungry creature! I thought of the sea turtle as I placed the balloon remnant alongside some seaweed and snapped a photo. “I can’t just leave it there now”, I thought. If I am going to show my class this picture to illustrate the dangers of plastic in a sea creature’s diet, they will certainly ask if I removed that plastic from the beach! So I grabbed a stick and picked up the purple balloon remnant and carried it off the beach to the nearest trash receptacle. The two gulls watched, fluffing their feathers in the wind. That got me thinking……. Back at the house, I started to research – what can I do as Earth Day approaches to make a difference in the environment? I found an app on the Ocean Conservancy website called Clean Swell which allows you to keep track of trash collected during a clean-up. This is perfect! After spending a good ten minutes coming up with a group name (McQs for the Deep Blue), I downloaded the app onto my phone and recruited my daughter to return with me to the beach. We retrieved some of the items I had passed by earlier – the pink coil keychain, the deteriorated pocket knife, the orange disposable razor, five straws and ten bottlecaps. All of these items were collected from a half-mile stretch of seemingly pristine beach in a period of 45 minutes. Imagine the amount of plastic that might be lurking beneath the sand at a much more traveled beach? Imagine the impact a larger group of volunteers could have? As Earth Day 2018 approaches, I WILL use less plastic by not purchasing water bottles. I would also like to organize or join a beach clean-up. This clean-up may be “a drop in the ocean”, but if more of us take this idea and run, it will be a much cleaner ocean when we’re done. (no rhyme intended). Who’s with me? 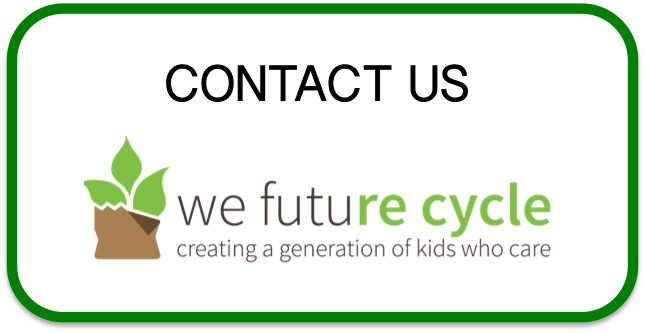 We Future Cycle is exceedingly proud that the White Plains and New Rochelle Schools are honored at the upcoming Westchester County Earth Day for their participation in the We Future Cycle Recycling Program that diverts 95% of their waste into recycling and composting streams. Ridgeway Elementary School Principal Tashia Brown will be receiving the award in the name of the White Plains School District and New Rochelle Jefferson Assistant Principal LeAnn Bruno will be receiving it for the New Rochelle School District. Both are well deserved, both are champion supporters of the We Future Cycle Sustainability Programs and have gone out of their way to personally support the efforts of their students.